Miranda Kenneally can do no wrong. I adore her Hundred Oaks series and can't wait to read the next installment! I love Miranda Kenneally too! Glad they changed the cover although I feel like this one also doesn't match with the rest of the series. Either way just excited to read it! I haven't read any of her books, but this one sounds really interesting! I haven't read a lot of YA books with running as a theme, but this one sounds really interesting. Great pick! This is totally new to me! Hope you love it! I've never heard of this series!! Checking out the first installment now! Sounds very good, you always pick great books! :D Thanks for sharing this one. this one sounds very interesting. The synopsis intrigues me. Great pick. I will have to add this to my wish list. Miranda Kenneally is fab and I like that she's a runner who's running from something (poor girl. That's a lot of guilt.). That sounds wonderful and I'm betting it will be inspiring too. Great pick. I've read the first three in the hundred oaks series, and the third one wasn't as good as the rest to me, so I hadn't been looking forward to anymore. 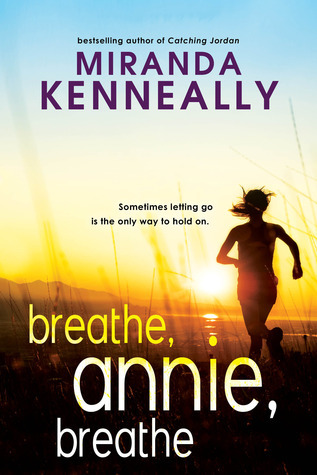 But I'm really looking forward to Breathe Annie Breathe! Already added it to my TBR. Thank you, that was an awesome pick! Not my kind of thing, but I have some friends who would love this one. Thanks for sharing! I'm glad they changed the cover for this one, even if it still doesn't match the other book covers, because I wasn't a huge fan of that illustrated cover. I've got to check out her books sometime! I haven't read any book by this author. Guess it's about time I start! Yep, she's now on my list of auto-read authors. Can't wait! Love Miranda too, so also excited for this one!